No match for a Harley! After Kenny Roberts had won two championships (1973 and 1974) with his XS 750, Yamaha dropped this old vertical twin, which had reached the limits of its development. The newly-arrived touring XV 750 seemed to offer an ideal basis for a replacement for the XS 750. 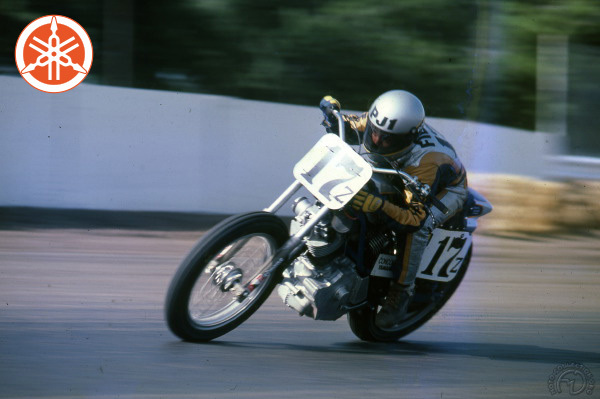 In 1981, Yamaha again made its move on the American Dirt Track Championship. Not wishing to compete officially in this endeavor, Yamaha approached Kenny Roberts and Mert Lawwill and asked Ken Clark, the director of his racing service, to take charge of operations. Since the touring bike was shaft-driven, the first task was to design a new gearbox output that would allow a chain to be used. Yamaha took part responsibility, and the frame was made in the US. Two riders, Mike Kidd and Jim Filice, were signed for its development and racing program. Though it was superbly made, the XV 750 didn't succeed in its objectives. Its handling had endless troubles. The engine was in turn shifted backwards and forward in the frame, the axis of the swing arm rear suspension was raised and lowered, but all to little effect. In the course of the season, Mike Kidd swapped his XV 750 for a Harley-Davidson 750 XR with which he won the title, while Filice just exhausted himself in the fruitless task of sorting out the XV 750. When the deal ended, Yamaha dropped the project. The XV 750 never lived up to Yamaha's expectations; some claimed that only 45- degree V-twins stood any chance in dirt-track mcing. The photo shows jim Filice in action at San Jose.